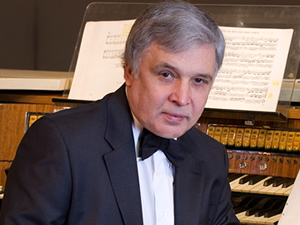 Professor Alexander Fiseisky today has a reputation as one of the most famous and influential organists in Russia. He is an Organ Soloist of the Moscow State Philharmonic Society, Director of the Organ Department at the Russian Gnessins’ Academy of Music, President of the Vladimir Odoyevsky Organ Centre, Advisor on new organs, Resident Member of the council which undertook the development of the standards of the Organ education in the entirety of the Academies in Russia, Artistic Director of numerous international Organ Festivals, organizer of international Learned Conferences, Jury Member in International Competitions. Alexander Fiseisky has given concerts in more than 30 countries, and amongst them some very special ones such as in the ‘Festival on the Occasion of the 50th Anniversary of the End of the Second World War’ in Vienna, and the ‘Special Concert for Parents, Children, and Families in Memory of the Children Murdered in Dunblane’. In July 1996 he gave the opening recital of the Gesellschaft der Orgelfreunde annual summer congress in Sheffield City Hall. In early November he gave the UK première of Mirzoyev’s Organ Symphony at Westminster Abbey, where he also recorded the work, and gave the USA première in Washington National Cathedral in May 1997. In July 1997 he played to half a million people during the ‘Mass for the 80th Anniversary of the Appearance of Mary’ in Fatima. In the Bach Anniversary Year of 2000 A. Fiseisky played the complete organ works of J. S. Bach four times in Germany (two times under the auspice of EXPO 2000 in Hanover, and once in a single day in Dusseldorf as Bach-Marathon). For this occasion he was given an entry in the book Records of the Planet Earth in Moscow. In the Handel Anniversary Year of 2009 he performed all organ concertos of G. F. Handel in Moscow and Hanover together with the Gnessins’ Baroque Orchestra. His discography includes more than 40 items under labels Melodia, Etcetera, Deutsche Schallplatten, Motette, Lammas records and others. Several works by noted composers have been dedicated to him, and his musicological offerings (e.g. the anthologies Organ Music in Russia, Organ Music in the Baltic States, published by Bärenreiter) have received first class notices everywhere. In 2009 a book about the history of organ and organ music was published by him in Russia. Alexander Fiseisky is a Stipendiary of the German Academic Exchange Service (Deutscher Akademischer Austauschdienst – DAAD). In 1997 he was awarded by President Yeltsin the title of Honoured Artist of Russia. In 2010 the Moscow Society of Composers awarded him with a Golden Medal for his contribution into the development of modern music.